Welcome back and thanks for checking out episode 3 of Beardy and the Geek. 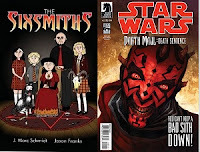 In this episode, Emmet and I cover Tom Taylor and Bruno Redondo's latest Star Wars mini, Darth Maul: Death Sentence, and the satanic slice-of-life comedy The Sixsmiths by Jason Franks and J. Marc Schmidt. As always you can listen through the player below or download from Open Archive and iTunes. Also, don't forget tho follow GeekOfOz and Emmet on Twitter! While you're at it, don't forget to comment and give us some constructive feedback - We'd love to know what we can do better AND what books you think we should be looking at!